Rhodia has been flying under my radar for a while when it comes to notebooks. I always use rhodia notepads to write reviews on, but I mostly used Leuchtturm notebooks in the past few years (that I still haven't reviewed! 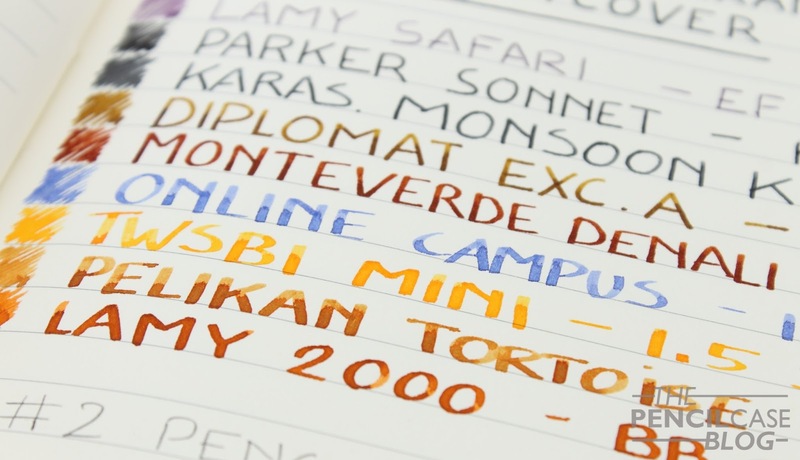 ), which have great paper that shows off inks with loads of shading and sheen. But Leuchtturm isn't the only brand that knows how to make a notebook! 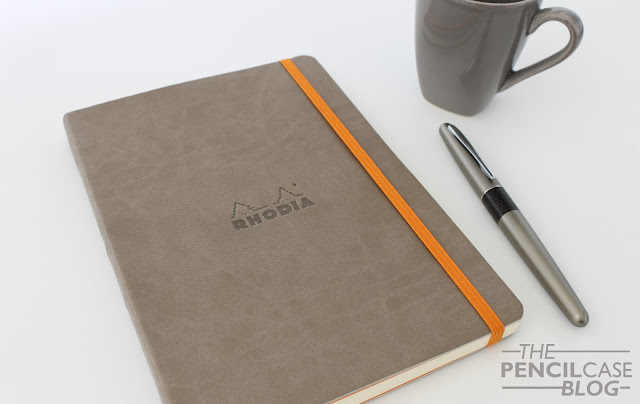 There are other viable options on the market if you're looking for a fountain-pen friendly notebook, and Rhodia is one of the brands to prove that. The particular notebook we're looking at today is the Rhodiarama softcover A5 notebook. It's the first softcover I've used in this size, but there are a couple advantages that make me want more of this. A5 is my favourite size for a notebook, it's portable, but it's still usable without having to contort your hand in all kinds of uncomfortable writing positions (I generally find smaller, pocket sized notebooks bothersome to use). This Rhodiarama makes for an even more comfortable writing experience because it's thinner (80 sheets vs. 125 sheets in a Leuchtturm hardcover), which makes it easier to write on, especially near the bottom of the page. Top to bottom: Field notes, Leuchtturm A5 notebook, Rhodia Rhodiarama A5 softcover, L!fe Tsubame notebook. 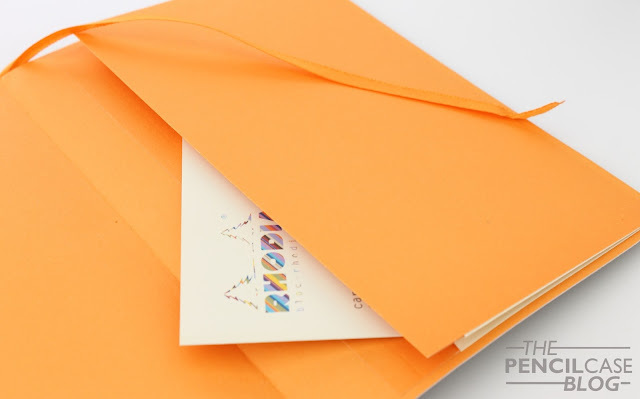 The Rhodiarama comes in a bunch of bright, but also less bright (like this Taupe color) colorways, all with orange elastic closure and orange paper on the inside of the cover. The cover is made of a soft and supple faux-leather material. 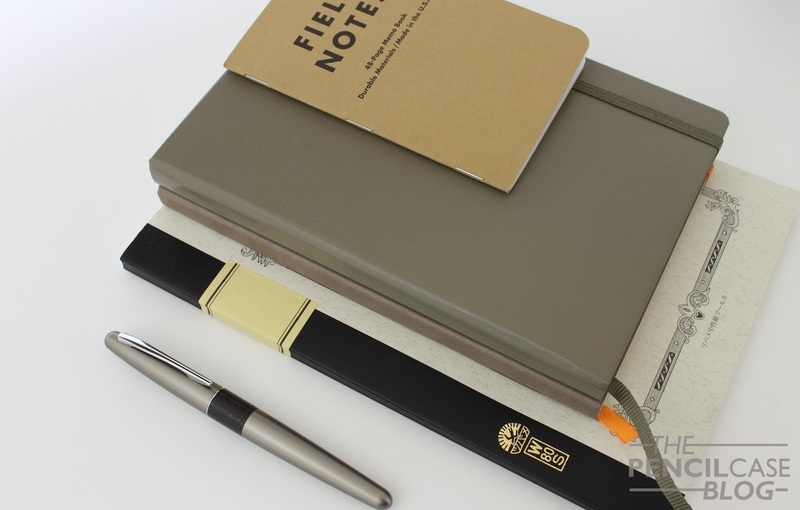 Worth noting is that the soft cover also allows the notebook to lay open quite flat (and stay open, most importantly). It has a pocket in the back and one pagemarker. It doesn't feature numbered pages, nor a content table, so if you are looking for flashy features, you'll be dissapointed. But then we come to the performance part, and this is where the Rhodiarama shines! 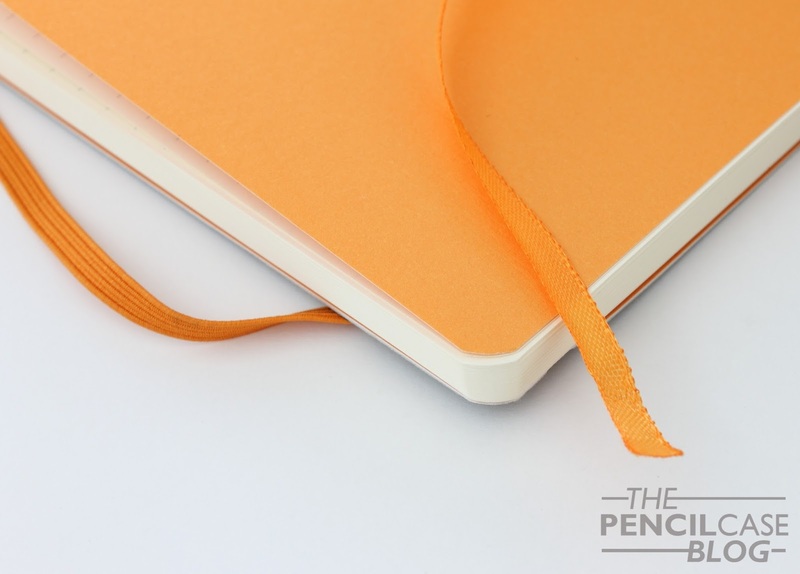 The lined 90gsm ivory white paper is smooth, as expected from Rhodia. It seems to be more fountain pen friendly than the last Rhodia webnotebook I reviewed a couple years ago (review can be found HERE). If they actually changed the paper since then, I don't know, but in any case it performs as desired so I can't complain. It takes ink like a champ, any line width and wetness I could throw at it, including a very wet 10mm dip nib. None of the writing samples bled through the page, even the dip nib couldn't make it feather or bleed. In terms of bleedthrough/ showthrough, it definitely beats the Leuchtturm. Both sides of the pages can be used without any issues with ghosting (showthrough). Dry times are slower than on Leuchtturm paper, which is due to the smoother vellum paper that Rhodia uses (Leuchtturm paper is more absorbent and dries slightly faster). Shading and sheen show well. Writing looks crisp and defined. Smooth paper like this is often more prone to grease from your hands, which can make certain nibs skip. I like to keep a guide sheet underneath my hand when I write to avoid just that. 10mm dip nib and q-tip ink swabs show loads of well-defined shading. The back of the page shows no bleedthrough, and very little showthrough. My experiences with the Rhodiarama notebook has put them back on the map for me. It's a simple but good-looking notebook without too much flashy features, but the paper is fantastic for fountain pen use, which is of course the most important aspect! You can pick up the Rhodiarama softcover notebook for 14 EUR/ 21USD (A5 size) from various retailers. Note: this notebook was sent to me by Exaclair USA, free of charge, so I could write this review. I was in no way influenced in the making of this review, the opinions shared in this review are completely my own! This post does not contain affilate links. I am looking to switch my paper source for an ink journal that I currently use. I love the Rhodia stapled top pads and how the inks perform on them. 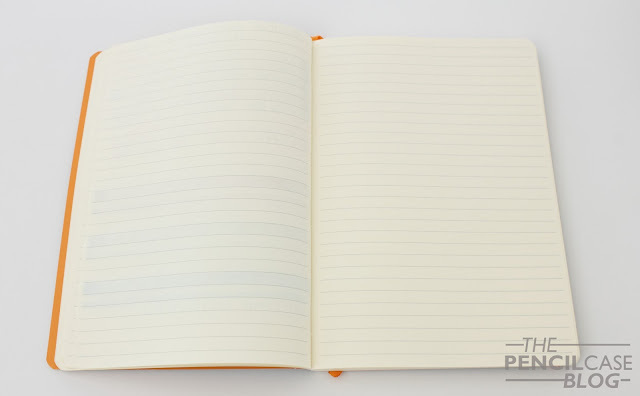 I was considering using a Rhodiarama notebook instead but noticed the paper is a touch heavier even though I would prefer to put the ink journal in a bound book vs a pad. 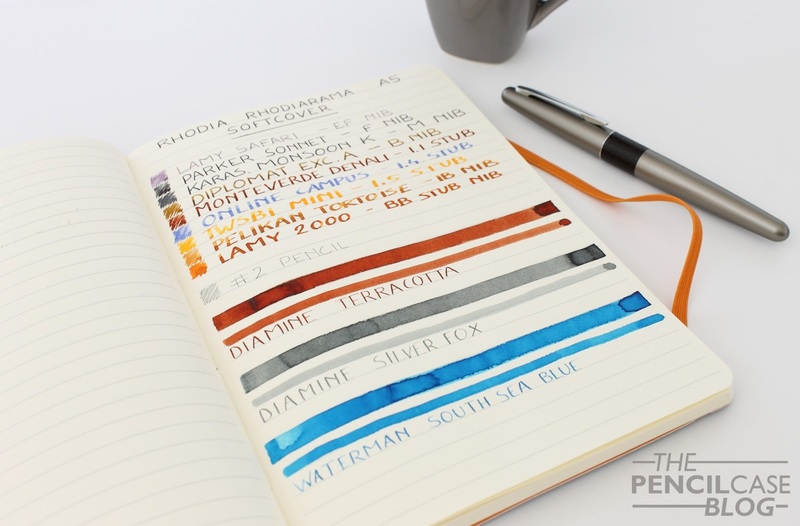 In your opinion would I loose any ink performance if I went with the notebook you have reviewed here vs the Rhodia pad or is it virtually the same? Thanks you in advance. From how I've tested it, the Rhodiarama performs the same as Rhodia's normal paper pads, I found the dotgrid pads to perform slightly subpar (I've noticed the same with a Leuchtturm dotgrid journal). You definitely won't lose performance on this paper compared to the pads. The only difference worth noting is that it has a 'yellow-ish' ivory paper, so your inks will appear a bit warmer on the rhodiarama paper. If you want to see the natural color of the ink, you should stick to the white paper pads.